Mrs. Jeanice Welsh Killed in Yakutat Earthquake. 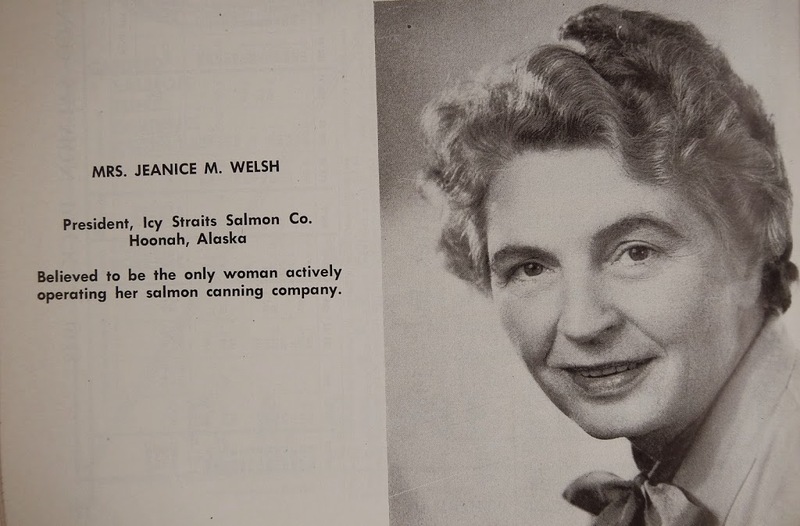 Mrs. Jeanice Welsh Walton, who was generally known in the salmon industry as Jeanice Welsh, and as the only woman who ever owned and personally operated a salmon canning business, died in the disappearance of a portion of Khantaak Island in the Alaska earthquake of July 9. With two friends, Mr. and Mrs. Robert Tibbles of the Civil Aeronautics Administration station at Yakutat, she had gone to the island on a picnic and to pick wild strawberries. In the earthquake the portion of the island on which they had been last seen was thrust high in the air, only to disappear utterly in the deep waters. The island was about a mile offshore in Yakutat Bay, where the Bellingham Canning Co., of which Mrs. Welsh was president, had a cannery. She was also president of the Icy Straits Salmon Co., which had a cannery at Hoonah. Mrs. Welsh was 54, the daughter-in-law of the late R.A. Welsh, Puget Sound canneryman who founded the Bellingham Canning Co., and widow of his son, Robin A. Welsh. Following her husband’s death, Mrs. Welsh took active charge of the family’s salmon canning business and, with her three sons, Warren, William and Robert, operated and expanded it. She later married the late J.L. Walton. She specialized in conducting her business in Alaska Native communities, and in cultivating the confidence, friendship and cooperation of the Indian people. In this she was markedly successful. Men in the salmon business have her full respect and regard as a woman of high character, a competent salmon canner and businesswoman, and a resourceful competitor.